Fatigue caused by repetitive strain is considered to be the primary cause of failure in metal structures and components. However, new research demonstrates how crystalline structures known as nanotwins are capable of slowing the accumulation of fatigue-related damage. 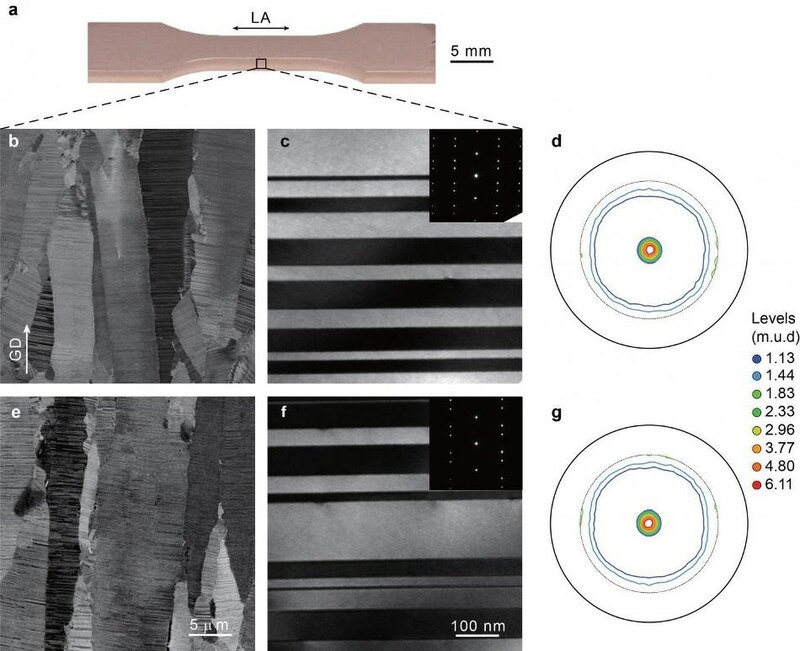 A recent study in the journal Nature demonstrates how metals can be patterned at the nanoscale to be increasingly resistant to fatigue, the slow accumulation of internal damage due to repetitive strain. The research concentrated on metal manufactured with nanotwins, small linear boundaries in a metal’s atomic lattice that have matching crystalline structures on both sides. The study explained that nantowins assist in stabilizing defects linked with repetitive strain that develop at the atomic level and restrict the accumulation of fatigue-related damage. Ninety percent of failure in metal components and engineering structures is through fatigue, this work represents a potential path to more fatigue-resistant metals, which would useful in nearly every engineering setting. Gao co-authored the study along with Haofei Zhou, a postdoctoral researcher at Brown, and also with Quingson Pan, Qiuhong Lu and Lei Lu from the Chinese Academy of Science. The researchers studied the fatigue effects of nanotwins by electroplating bulk samples of copper with twin structures that are closely spaced within the plates’ crystalline grains. Then they carried out a series of experiments in which they repeatedly stretched and compressed the plates at varied amplitudes of strain measuring the material’s associated stress response employing a fatigue testing system. Starting with a strain amplitude of 0.02%, the researchers gradually increased the amplitude every 1,500 cycles to 0.04, then 0.06, finally reaching at 0.09 prior to stepping back down via the strain amplitudes. The tests revealed that the stress response of the nanotwinned copper rapidly stabilized at each strain amplitude. Gao said, the study more significantly discovered that the stress response at each strain amplitude was the same even during the second half of the experiment, when the metal was cycled via each strain amplitude a second time. This explains the fact that the material did not soften or harden under the strain as most metals would be expected to do. Despite having already been through thousands of strain cycles, the material showed the same stress response, that tells us that the reaction to cyclic strain is history-independent — the damage doesn’t accumulate the way it does in common materials. For comparison, the researchers carried out similar experiments on non-nanotwinned samples, which revealed significant hardening and softening (based on the material) and then displayed the type of cumulative fatigue effects that are typically observed in most metals. The researchers carried out supercomputer simulations of the metal’s atomic structure in order to understand the mechanism behind this fatigue resistance. Material deformation, at the atomic level, manifests itself via the motion of dislocations, referring to line defects present in the crystalline structure where atoms are pushed out of place. The simulations exhibited that the nanotwin structures organize strain-related dislocations into linear bands known as correlated necklace dislocations, which have been named for their beaded-necklace-like appearance in simulation. The dislocations, within each crystal grain, remain parallel to each other and do not block each other’s motion, which is the reason why the effects of the dislocations are reversible, Gao says. However, the metals are not entirely immune to fatigue. The fatigue resistance revealed in the study is within each crystalline grain. There is still damage that collects at the boundaries between grains. However, within-grain resistance to fatigue “slows down the degradation process, so the structure has a much longer fatigue life,” Gao said. Gao’s research group has extensively worked on nanotwinned metals, earlier demonstrating that nanotwin structures are capable of improving a metal’s strength — the potential to resist deformation such as bending — and ductility, referring to the potential to stretch without breaking. This recent finding suggests yet another advantage to twinned metals. He and his colleagues anticipate this newest research to inspire manufacturers to discover new ways of developing nanotwins in metals. The electroplating method employed for fabricating the copper for this study is not practical for making huge components. Moreover, while there are a few forms of twinned metal presently available (for example, twinning-induced plasticity or “TWIP” steel), scientists are continuing to look out for efficient and cheap ways to make alloys and metals with twin structures. It’s still more of an art than a science, and we haven’t mastered it yet, we hope that if we point out the benefits you can get from twinning, it might stimulate fabrication experts to find new alloys that will twin easily. The U.S. National Science Foundation (DMR-1709318) and the National Natural Science Foundation of China supported the work. The U.S. NSF’s Extreme Science and Engineering Discovery Environment (XSEDE) provided computer simulation resources.